I know legal stuff can seem intimidating—and lawyers are expensive—which is why I invited today’s guest on the show. Bobby Klinck is a lawyer and online entrepreneur who helps other online entrepreneurs get their legal protection in place quickly, easily, and affordably. Unlike typical lawyers, Bobby’s whiteboard is filled with notes on platform building, inbound marketing, and sales funnels. His unique mix of expertise makes him the perfect person to teach legal to entrepreneurs and bloggers in the online space. Bobby graduated from Harvard Law School and worked at prestigious law firms before transforming from a traditional career path into one of his own. 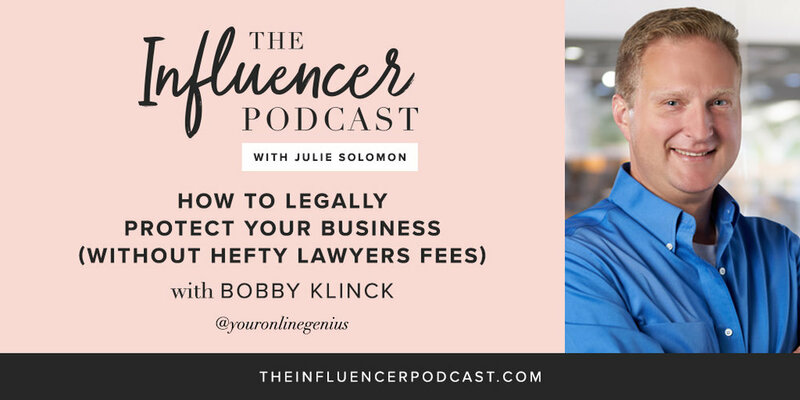 On top of making legal stuff less daunting, Bobby knows a thing or two about building a business on your own terms … and he’s sharing it all with us today. I can’t wait for you to hear his amazing insights in today’s episode! I’ve love to hear your thoughts in the comments! Have you taken steps to protect your business? If not, what’s holding you back? Did you know that we love to dive into your thoughts and feedback on our newsletter? We share even more from the guests, like their favorite apps and the best career advice they’ve ever received (plus more cool stuff), along with YOUR thoughts too! And if you loved this episode, you’ll also love Episode #51: “Legitimizing Your Business + Taxes and Contracts,” where Laurel Mintz talks about setting up a smart—and legitimate—business model. You know I love to chat….especially with you! Snap a screenshot and tag me and @youronlinegenius on Instagram as you’re listening to this week’s episode. And remember to hashtag #theinfluencerpodcast, that way I can share your screenshot on my story too!